The New Forest Aviation Group enables people with an aviation interest to meet, listen to a speaker, and to socialise with friends during a tea break. Meetings are held on the second Friday of the month (not Aug or Dec) with doors open at 7pm for prompt 7.30pm start at Lyndhurst Community Centre. Following his New Forest Airfields Exhibition in 1992, Alan Brown met with a small group of aviation enthusiasts to discuss starting a group who could meet regularly to discuss Aviation in any of it's various forms. With others, the Group was founded in the same year by Alan Brown along with Sid Deedman when both were writing books about the WW2 airfields around the New Forest. The inaugural meeting was held in the Lyndhurst Community Centre on 9th September 1992 with a group which included Alan Brown, Alan Vernon, Monty Ward, Mac McCoubrey, Sid Deedman Fred Hambly and John Thompson. 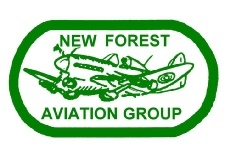 Alan Brown was elected Secretary and the New Forest Aviation Group was born. Membership was open to anyone, the only qualification needed was an interest in aviation. The Group continues to meet once a month with speakers on aviation topics and occasional visits to places of aviation interest. The first outside visit organised by the group was to the FLS Aerospace Plant at Hurn Airport in 1993 to see the newly set up production line for the Optica Observation Aircraft. Other visits followed to places like Hendon, Duxford, Cosford, Wroughton, Brooklands, Salisbury Hall, etc. Alan Brown was an inspiration to us all, his infectious enthusiasm for aviation and especially New Forest Aviation History knew no bounds. Since it's inception Alan was General Secretary, then Chairman until deteriorating health forced him to step down.It is a tribute to those original members past and present who over the years have contributed so much of their time and enthusiasm to ensure that the group continues to exist. Aviation has always had a large following in our country, especially in this area of southern England where so much aviation history has been made down the years. Our logo depicts a Typhoon taking off from a New Forest airfield as drawn by Alan Brown. Edited from a history by John Thompson, a founder member.